WebRTC allows for video and audio streaming directly inside a web browser with the need for any cumbersome plugins to be installed in the browser. This is great, however there is an unfortunate side-effect to this and it is the risk of our real IP leaking through your browser and destroying the anonymity you gain with using proxies. Please understand that this is not ActProxy’s proxy servers leaking your real IP, it is your local web browser. We’ve tested many services with our proxies and we have found that the issue is present in Windows and to a lesser extent on Android, Linux, and OS X. We’ve also been able to reproduce the issue on iOS. To check if you’re leaking your real IP you can go here or here. With the first option, if you have disabled WebRTC or your browser does not support it, no IP addresses should show up under Your local IP addresses: or Your public IP addresses:. The second option should be fairly self explanatory. 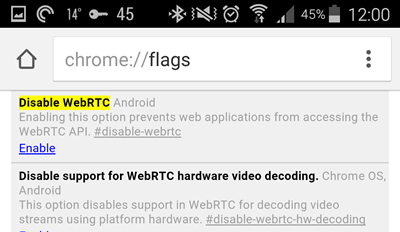 Please keep in mind that disabling WebRTC of course will lead to WebRTC applications not working. Therefore you might want to re-enable it when you're not using proxies. If you find out that your browser is in fact leaking your real IP don’t panic, you have options now. Please continue reading for the fixes. You can read more about WebRTC here. Newer versions seem to implement WebRTC. Use Firefox or Chrome instead. Chrome on iOS does not seem to implement the vulnerable parts of WebRTC yet. 1. The uBlock Origin browser extension is also available for Chrome and works for Opera as well (see below). 2. Google offers an official extension which we’ve tested and works quite well. It is the WebRTC Network Limiter browser extension which prevents IP leaks without fully disabling WebRTC so you can still enjoy WebRTC enabled content. You have a couple options with this powerful browser. Note that the Tor Browser (which is based on Firefox) disables WebRTC by default. 2. 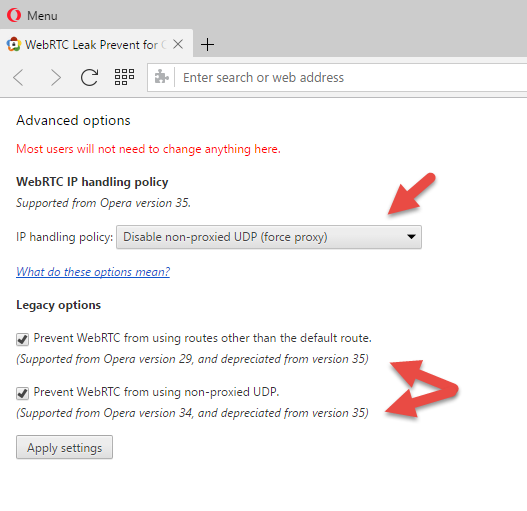 Set “IP handling policy” to: Disable non-proxied UDP (force proxy), and tick both options under “Legacy”. Internet explorer does not implement WebRTC yet. Safari does not implement WebRTC yet. The WebRTC “problem” can be dangerous for proxy users, by possibly revealing your true IP address which certain websites may or may not be setup to detect. Proxy providers obviously do not want their user’s real IPs to be shown anywhere and ActProxy wanted to take a further step in publishing this tutorial in our FAQ section in order to protect our users, most of whom are are likely unaware of this threat. In the meantime, at least once you are aware of the problem, it can be easily fixed. How do I change my auth IPs? How do I change or view my proxy username and password?